One person is battling for his life following an explosion on a Togolese oil tanker off the coast of Old Ningo in the Greater Accra Region. The vessel, christened MV Synagogue, was said to be transporting oil when it caught fire during repair works by technicians. This, according to reports, led to the explosion about 13 nautical miles off the coast of Old Ningo. The rescue team, made up of officials of the Ghana Navy and the Ghana Ports and Harbours Authority (GPHA), worked tirelessly to quench the fire but the vessel got burnt. A member of the crew, who sustained life-threatening injuries, was initially rushed to the Tema General Hospital where he was resuscitated before he was referred to the 37 Military Hospital in Accra for further treatment. Meanwhile, officials say investigations have begun to ascertain the cause of the fire. 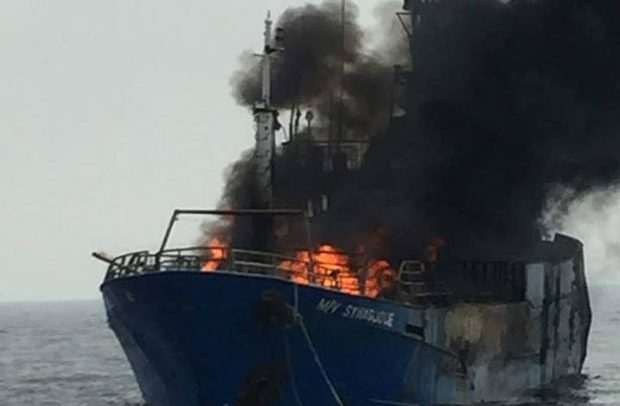 Lieutenant Eric Agyei, Acting Commander of the Ghana Navy Ship (GNS) aka ‘Bonsu,’ who led the rescue team, mentioned that they received a distress call on Monday morning about the burning of the vessel. According to him, they swiftly sailed with two medical personnel aboard their vessel to search and rescue the crew. “We realized that the crew had abandoned the ship. We went aboard the other vessel and later handed them over to the port authorities. GPHA Harbour Master, Captain Christian Yeboah-Asante, who took custody of the crew, said investigations are ongoing to ascertain the cause of the explosion and fire. According to him, six members of the crew, who were all Ghanaians, were rescued. “I had a call from the signal station that there was fire on the vessel. I quickly ordered them to dispatch two tugboats and one speed boat. On arrival, the six crew members had abandoned the vessel to save their lives and one sustained some burns. “We conveyed the burnt person to hospital in the speedboat and he is responding to treatment. When we initially got there, we tried to put off the fire. The rescue team returned to the scene to convey the vessel to the port only for the fire to start again. As at the time of filing this report, personnel of GPHA were working tirelessly to clear the wreckage to avoid any accident on sea. Meanwhile, the remaining five crew members are also seeking treatment due to injuries they sustained.